If you have finally met the girl of your dreams and you are planning to take the big step of proposing your girl, then you have come to the right place. Here you will find the top 10 most romantic ways to propose a girl and believe us, you will not go empty-handed. Girls always want their proposal day to be a special one, so if you are going to propose to a girl, make sure that you do that in the most romantic way. Although there are thousands of romantic proposal ideas depending upon your budget and interest but we will be sharing the best and the most romantic ways to propose. 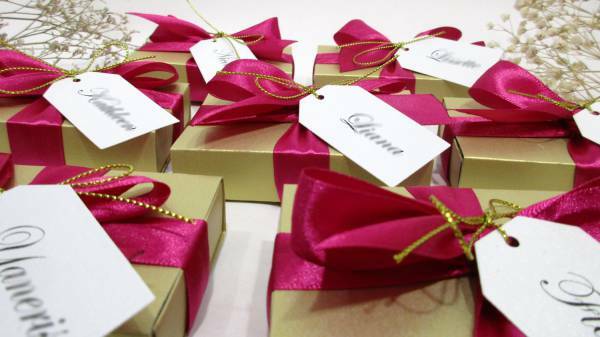 We have listed down the top 10 ways in which you can propose your girls. You can choose any idea depending upon your budget, efforts you want to put in and your comfort. Some proposal ideas are going to dig a big hole in your pocket while others will not cause you a penny. So, let’s check out the romantic ways to propose a girl for the marriage. This one will always be at the top of the list; being the most expensive and also, the most romantic ways to propose. If you and your girl love to travel and you are high on budget, then you can take her to her favourite destination in the world and then see the perfect time to ask her that magical question ‘Will you marry me?’. We really hope that the result will be positive from her side. Believe us, she’s going to remember the special day for the rest of her life. This marriage proposal idea is only effective when you have full confidence that your girl is going to accept your offer. If you are pretty sure of the answer, then this is one of most romantic ways to propose to her. Take her to a public place for eg. a mall or a shopping centre and don’t forget to hire a photographer and a music band. Just when she is not looking at you, signal the music band to sing her favourite song and bend down on your knees to propose her. She’s gonna feel your love all the way from her heart to her brain. 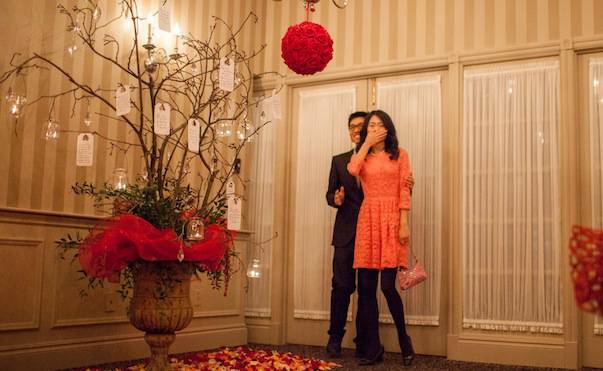 If your girlfriend loves surprises, then she’s gonna love this proposal idea. All you need to do is to make an excuse for not going to work and make sure that your girl goes to her office. After that, you have a full day to prepare for that special moment, decorate the full house, order some exotic food and buy an expensive ring. Switch off the lights and the moment she opens the door, surprise her with all of your arrangements and finally, ask her that special question ‘Will you marry me?’. Believe us no girl in the world will answer No to that question. This is one of the oldest and the most romantic ways to propose a girl. We often see in movies that guys try to charm their loved one over a candle lit dinner. The best thing about Candle lit dinner is that it’s not going to burn your pocket. You can easily plan the place and arrangements as per your budget. 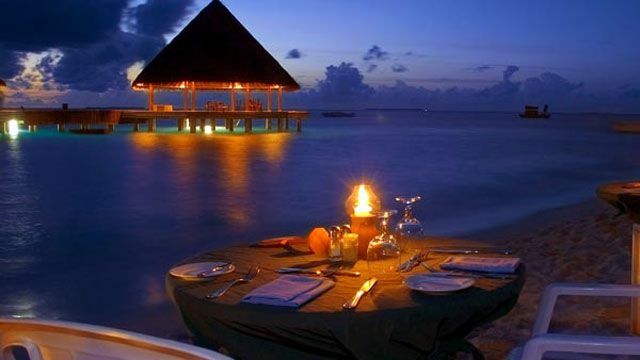 Take her to that romantic place and just make sure that all arrangements are perfect. When the candles are giving dim light and there is romance in the air, you can ask her the most important question of your life. If you are a lazy fellow and you don’t’ want to leave the comfort of your home while proposing a girl, then you are going to love this proposal idea. You can choose any day when you both are going to be at home and the time, she goes to take a bath or to the local market, you can make the necessary arrangements like write the question on the wall or order a cake on which ‘Will you marry me?’ is written and just when she comes back, you can celebrate your special moment at you lovely place. While this is one of the most romantic ways to propose a girl, it is also one of the widely used proposal ideas. 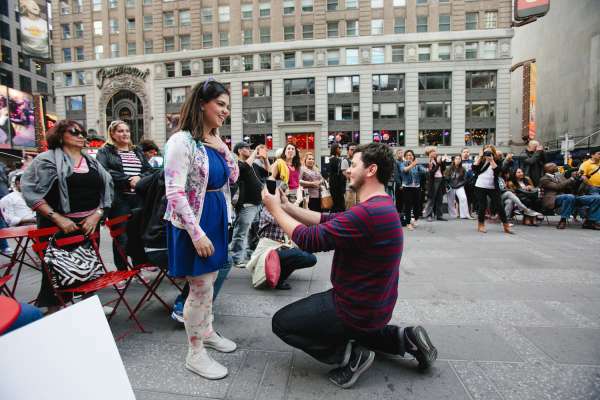 Remember the days, when proposing on a radio was a bid deal but that’s not the case anymore. Many radio channels can take a small fee or can offer the service for free. Just make sure that you both are free at the planned time and switch on the radio, also don’t forget to bring some gifts and the marriage ring. The moment RJ announces her name on the radio, bend down on your knees and ask her the special question. Don’t miss: Want To Impress Your GF, Try ‘I Love You In Different Languages’. This idea is one of the best and most romantic ways to propose to a girl when you are in a long distance relationship. It’s simple and pretty cheap, all you need to do is to send her gift according to your budget. There are several gifts available in the market for that special moment. Even some gifts are so beautiful and innovative that your girl will feel your love through this gift. You can also video conferencing side-by-side to capture the reactions of your girl. 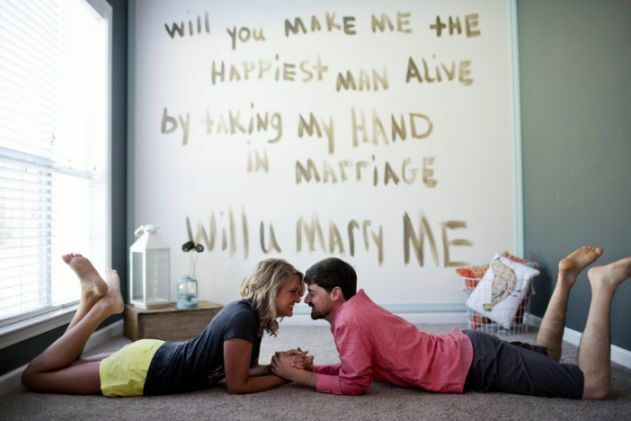 This proposal idea is our absolute favourite and one of the most creative ways to propose a girl. 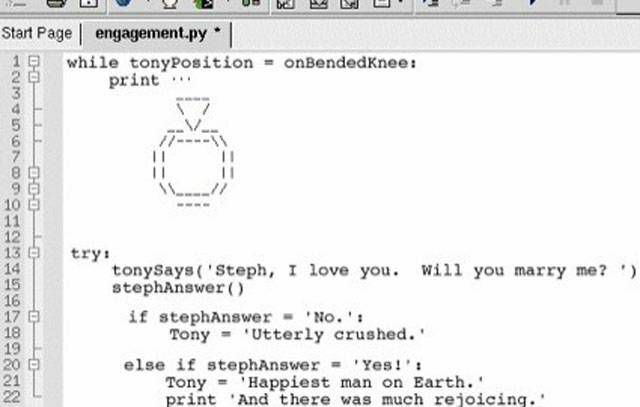 If you both are working in a tech field, then this is one of the best romantic ways to propose a girl. All you need to do is to write a small program expressing your love for her and put the special question anywhere between the code. Email the program to her and ask your girlfriend to check the code ones. The moment she will open the program, she will understand what you have asked and if she’s a passionate techie, she will send the program back with an answer(probably ‘Yes’) hidden in it. While this is one of the most iconic and romantic ways to propose a girl. Believe us your better half will remember it for the rest of her life. Although this proposal idea may cause you some thousands of dollars. All you need to do is pay for the signboard which will mention her name and the special question you want to ask her. Hopefully, she will feel the warmth of your love and probably say ‘Yes’ to you. 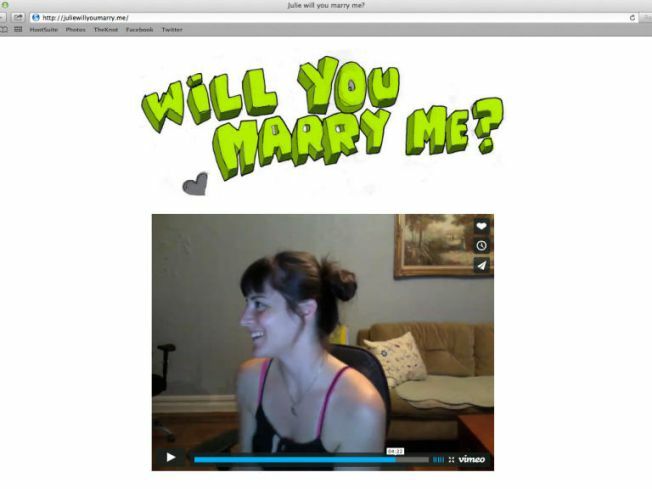 Video Proposal idea is one of the simplest and cheapest romantic ways to propose your loved one. But you can make it special by sending a mobile or tab to your girlfriend. Don’t forget to record a special message in that phone and also, record your proposal in a very special way. 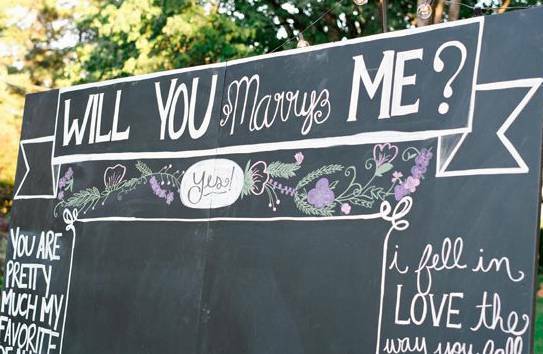 We believe she will get flattered over your sweet gesture and will surely say ‘Yes’ to your proposal. Related: 15 Ways To Say I Love You Without Actually Saying It. Do let us know which one of these top 10 romantic ways to propose to a girl you are gonna try for your special day. 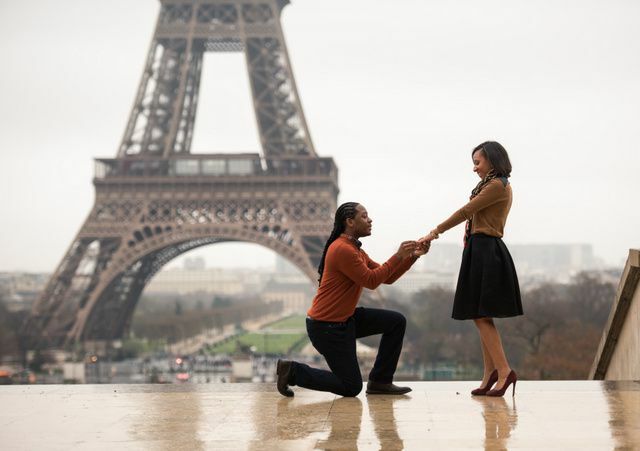 If these proposal ideas worked for you, share this post with your friends and loved ones.